With the lovely warm weather we’ve just enjoyed over the weekend, we think we can safely say that spring has sprung! The trees have already started blossoming in shades of pinks, yellows and white, and our gardens will all shortly be full of wildlife. 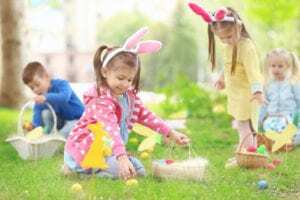 At Village Products, we think the best thing about spring is Easter and getting to spend time with our families in our gardens, and there’s no greater joy than seeing the smiles on our kids’ faces when they take part in the activities we plan for them. We therefore thought we’d share some of them with you, so that you can also create some happy memories there to! Always a favourite and so simple to organise! 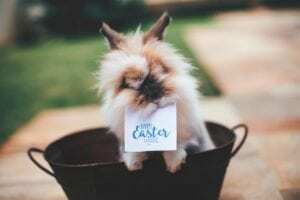 You can hide eggs of all shapes, sizes and colours around your garden, whether that’s in bird houses, in bushes or among the flowerbeds and give your children little baskets, buckets or pails to collect their eggs in. We sometimes hide a golden egg in our garden which equals a special prize. 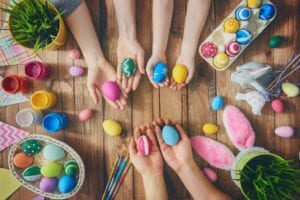 We all know how messy paint can be, so spare your kitchen table and cupboards and let your kids enjoy some egg decorating outside! There’s a vast array of options available: glitter, googly eyes, feathers, stickers and pipe cleaners – so why not set out a mat on the grass and let your kids get to work. You could even hold themed competitions and get them to create characters from their favourite shows, and ask them to create Easter-based creations. Their creativity is endless! Create Your Own Sock Bunny. These cute furry friends can keep your children entertained for hours. 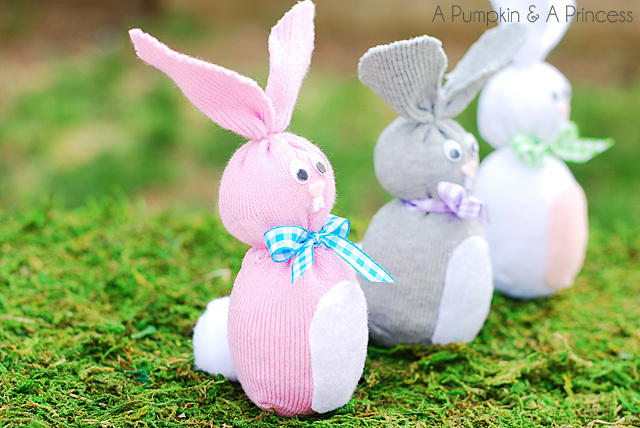 All you need is a small sock, some felt, large pom poms, googly eyes, elastic bands and ribbon, as well as some rice to fill the bunnies with. A great way to teach your kids about recycling, these bunnies can make the best companions for your kids this Easter. Get your spoons at the ready with this fun game, especially with our own little twist! Set up challenges around the house and garden that make keeping the egg in the spoon all that more difficult. Hopping on one leg, jumping through rubber tyres on the grass, having to slide down a slide and answering riddles can help keep everyone on their toes. With so much to do, you’ll have endless hours of fun with your kids in the garden. 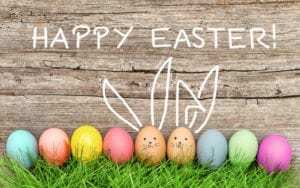 Happy Easter everyone!